The other day, Assassin’s Creed Odyssey hit me with a real slobberknocker: It told me that a family I’d decided to save from impending slaughter earlier in the game was carrying a disease that ended up spreading to a whole island. My character, Kassandra, was immediately distraught. “We can go back anytime you want,” another character on my ship said in a conciliatory tone. So I went back. Nothing happened. Don’t get me wrong: things were different on the island, but only marginally so. There were a handful of sick people lying around, and a distinctly plague-y fog stank up portions of the place. I felt bad, so I scampered around searching for new quests that’d allow me to mop up my mess, turn back the tide on all the misery a little, or at least get the plague myself. But I found nothing. Just to make sure I hadn’t missed anything, I searched Google, then the Assassin’s Creed Odyssey subreddit. One person who claimed to have been playing for more than 50 hours said that they had not seen any new quests ever pop up, and others agreed. Let me delve a little deeper into why this is a problem. In most other circumstances, this would be an interesting consequence to a player’s actions. During the early-game quest that led to this moment, the dude who was about to slice this innocent family to innocent ribbons explicitly told me that killing them was the only way to contain a plague. 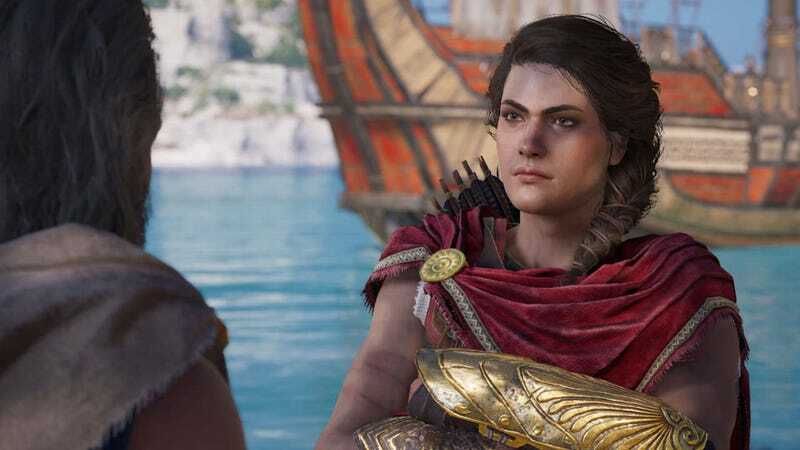 I probably would’ve just let it happen if a) the family hadn’t been close friends with an orphan Kassandra had befriended, and b) the dude didn’t seem like a total jerk. In the grand scheme of things, though, I guess I fucked up: I made a short-sighted decision that may have sunk an entire island. I’m glad the game didn’t give me a glorified “undo” button after that. But here’s the thing: This island was the first one in the game. Kassandra’s home. The people she presumably cared about more than anybody in the world lived here. Markos, the bumbling schemer who basically adopted a young Kassandra after her father left her for dead. Phoibe, the orphaned girl Kassandra mentored, and the first character you meet after the game starts. When I went back to the starting area, I couldn’t talk to either of them, nor the other characters I’d met while questing around the island at the beginning of the game. Most other games have taught me that, if a key character says, “Hey, a thing of near-apocalyptic significance happened in the starter area, and you can go back any time,” there’ll be important stuff to do there. Assassin’s Creed Odyssey gave me a dead end. At that point, I could only ascertain that Kassandra didn’t care all that much about where she came from—that she wasn’t the proto-assassin with a heart of gold I took her to be. This wasn’t the first time I’d felt a pang of uncertainty about my conception of Kassandra. I’ve felt more of them every time Odyssey’s narrative has tripped over a tangled, knotting mass of open-world systems. Most memorably, there was the bit where the game introduced its mercenary system, which populates the world with roving mercenaries just like Kassandra. A Spartan ally had hired Kassandra to figure out who dispatched a Spartan caravan and stole its supplies, which ultimately led her to a cave full of displaced Athenian civilians who claimed that a mercenary had done the dirty work and then told them where to find the food. So this mercenary was working for the enemy, but he had what seemed to be a noble streak to him. Odyssey’s mercenary system is pretty blatantly inspired by Middle-Earth: Shadow of Mordor’s nemesis system, which generates orcs with strengths, weaknesses, quirks, and personalities that evolve in reaction to your victories and defeats (and when you drop beehives on them). My encounter with this first mercenary, I figured, would produce a moment like that—especially given that he demonstrably had at least some shred of virtue in him. So I crept up on him and quietly knocked off about half his health bar. At this point, I had a decision to make: I could either finish him off or knock him unconscious. I accidentally did the former. Distraught, I fled into the reassuring arms of my old pal Google to see if I’d missed anything. Nope. This character, it turned out, wasn’t even important. Beyond the quest and the little two-sentence description he got in the mercenary menu, he was nobody. I reloaded my save and tried knocking him out just to be certain. All that changed is that, after I KO-ed him, I could “recruit” him to join my ship crew instead of killing him. That did, I’ll admit, assuage my guilty conscience a little bit, but it didn’t serve as any sort of pay-off for all that setup. The mercenary system, then, is like the nemesis system if its personality was entirely told and barely shown—little more than a list of predictable strengths and weaknesses and a justification for beefed-up enemies occasionally trying to hunt you down. They spice things up, sure, but they don’t make me care. And again, given how that whole quest played out, I’m forced to wonder if Kassandra really cares, either. The kill-or-KO dichotomy is the cherry atop that half-melted sundae. Most quests Kassandra gets sent on involve killing in some way or another. Usually, they involve killing people. Guards, bandits, Athenians, Spartans—it doesn’t particularly matter, given how interchangeable the game’s factions are. Technically, Kassandra can KO anybody she fights or sneaks up on, but the game doesn’t acknowledge it in any way that reflects on Kassandra as a character. If you KO enemies, you just get another resource: potential ship lieutenants. They offer different stats, but are otherwise interchangeable. So you may as well play as an unrepentant murderer, which you absolutely will if you opt to mostly kill your way through the game’s 70-plus hours. There are so many people to kill—I’m only 15 hours in and have probably killed at least 400 by this point—and in many cases Kassandra cheerily returns to quest-givers like she’s just bought them milk from the grocery store and helped a puppy with a sprained ankle cross the street along the way. It’s resulted in an experience that’s felt almost unbearably dissonant to me. Either I accept that this game world just doesn’t react to a lot of things it feels like it should be reacting to, or I view Kassandra as some kind of distant, cold-blooded psychopath who only pretends like she cares sometimes—which I don’t think is what the game’s creators were going for. However, in a world where constantly warring yet interchangeable factions drive everything and you get to decide if people become corpses or currency, it’s alarmingly plausible. It’s not hard to see, at least in part, where this dissonance comes from. Odyssey is a dissonant game, its DNA composed partially of systems from story-driven RPGs like The Witcher 3 and partially of the Assassin’s Creed series’ action-and-stealth legacy,with ideas from games like Shadow of Mordor sprinkled on top for good measure. It’s so close to being an RPG that it creates RPG-worthy expectations, but it’s never quite able to go all the way. It’s trying to do a whole, whole lot, but it needs to be an Assassin’s Creed game first and foremost, even if—as Kotaku’s Heather Alexandra pointed out in her review of Odyssey—that’s come to mean less than it used to over time. Given the preposterous scale of Assassin’s Creed Odyssey and the teetering stack of open-world systems its narrative needs to support, I don’t think there’d realistically have been a way to make a game with the reactivity I’m asking for here. My real issue is that scale of this magnitude takes a toll, and it can leave even the biggest, most detailed worlds feeling hollow. Moment-to-moment, I’ve been enjoying my time with Odyssey a lot, but I’m not at all attached to it. I imagine I’ll get bored and quit in the near future, and when I do, I doubt I’ll look back.